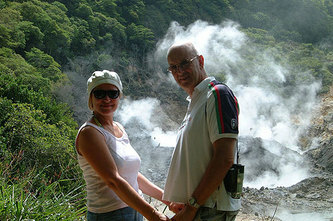 A tour of the St. Lucia Volcano is an amazing experience. The World's Only Drive-in Volcano has preserved it's place right here on the pristine Caribbeann island of St. Lucia. 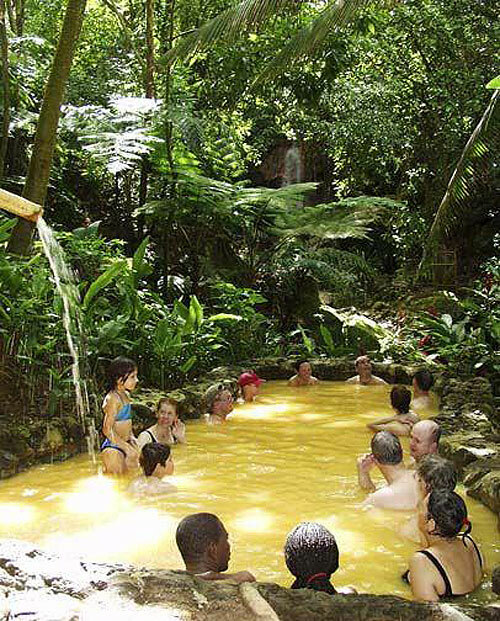 Located in the south-western part of St. Lucia, Mount Soufriere also known as Sulphur Springs emits a strong scent of rotten eggs or as some say decayed onion, and this ordor just can't be neglected once you are near. The last minor eruption occurred in the late 1700’s. It was only a steam eruption but not one with magma and ash. In the 1830’s approximately 760 tons of sulphur was mined and exported. It’s been 400,000 years since volcanic activity occurred here, but the pit that resulted from a collapsed dome of molten lava at the La Soufriere volcano presents a fascinating picture of what the earth must have looked like back then. Now dormant, the volcanic landscape of this gigantic crater with its sluphuric waft is now an amazing attraction for travelers world-wide. Unfortunately walking in the crater is now prohibited after one of the guides (Gabriel) fell in a pool of boiling water when he was jumping up and down on the it . Luckily for him, it was only waist height, he was rescued but suffered some severe burns from the waist down, after this grueling incident he opted to work as a fisherman. The people of Soufriere live on great superbia having two esteemed world renowned sites right at their door steps. In fact, there are people living within the perimeter of the craters. A tour of the St. Lucia Volcano "Sulphur Springs" offers a direct and fascinating lesson in the violent geology of the Caribbean Rim and with more than 20 belching pools of muddy water, multicolor sulfur deposits, and other assorted minerals such as iron, copper oxide, magnesium baking and steaming on the surface, one will be fascinated to know that not only is this massive volcanic crater a simple site for educational lessons and part of St. Lucia's brutal history. But it is also a known fact that the black/greyish, mineral water has therapeutic qualities and you will find people who go to bath there in order to remove blemishes on their skin or just to be rejuvenated, and that it surely delivers. So come on, relax and truly let go in those waters you can certainly add 10 years of life by bathing in the sulphur, so wipe that mud all over and take a comfortable soak. This is a St. Lucian excursion always waiting to share it's sulphuric stink with its guest. 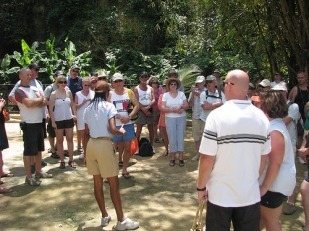 More on Shore excursions in St. Lucia.